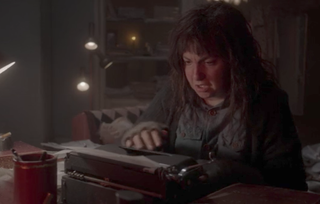 "Valerie Solanas Died For Your Sins: Scumbag"
Shows have been accused, rightly so, of increasingly creating “fan service” episodes, appearing to pick storylines (or at the very least, sexual tension) right from the pages of a Tumblr blog. This week’s AHS—at least the very extended flashback to the ’60s and ’70s—definitely seems like a piece of fan fiction, ripped from a Men’s Rights Activists’ very niche Reddit thread devoted to Girls. Trolls everywhere can now see their worst nightmare come to life as Lena Dunham (as the real-life would-be assassin Valerie Solanas) literally advocates for the death of all men. You can practically see the #NotAllMen hashtag shutter. We start back in the ’60s, when Andy Warhol’s Factory was in full swing, $5 went a long way at your local ammunition shop, and it was hard for a woman screenwriter to get her work produced, since she had to deal with condescending, sexist male filmmakers and gatekeepers at every turn (isn’t it great when a flashback storyline tackling a social problem is still amazingly topical fifty years later?) 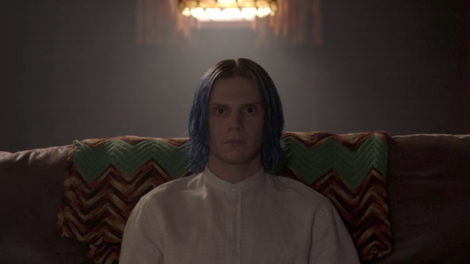 Evan Peters does not phone in his Andy Warhol impression (though so much work is done by the wig), and it was actually a nice break, in the middle of a season so full of people teetering on the edge of sanity, driven completely mad with anxiety and frustration, to include someone so incredibly chill. Seriously, his delivery of “Hi, Valerie” was like a mini-vacation amidst the gore. The moment he complements Solanas’ make-up, not knowing she has a gun stuffed in a paper bag meant for him, is a perfect detail (telling her to smile would have been a little too much). It’s not about justifying her actions, but with one line, capturing the years of frustration and microaggressions that drove her to this point. Back in the present day, Beverly finally begins to see Kai’s promise of equal power might not have been made in earnest. When she shows up to their hang-out post-election victory, she’s greeted by what appears to be some kind of Aryan Nation fight club. The men are “new volunteers” who have come to support Kai, the victim of a mass shooting carried out by an angry Hillary Clinton supporter (if only they could have seen Meadow’s real voting day write-in) who gained so much press for his war wound (casualty of the culture wars, of course) he was actually retweeted by Eric Trump. It’s palpably obvious Beverly isn’t welcome in the man cave on steroids, a feeling that becomes explicit when Kai dismisses her reminder of “equal power” and Harrison escorts her out. With the captions on, Beverly’s retreating back is captioned “men chuckling.” That laughter only seems to fuel the frustration that led her to let a kid with blue hair convince her to go on a killing spree in a clown mask. So it almost makes sense when she runs into the arms of a woman smoking a cigar in a cloak she must have stolen from the set of Hocus Pocus (Frances Conroy as Solanas’ old girlfriend Bebe Babbitt). Bloody story time with Babbitt is fun, if a bit one-note. The tale of SCUM, Solanas’ feminist group with only one directive, kill all men, (and certain female male sympathizers) does provide a simple parallel to the rise of Kai. People are angry. They organize under a charismatic leader. They agree when the leader declares those responsible for their misfortune must be killed. Bloodshed ensues. But within the madness of Solanas’ violent manifesto and subsequent schizophrenic ramblings are some visceral truths. Dunham gives 110% to her monologue to a vision of Warhol. When she whispers, (looking manic or, as the Warhol hallucination puts it, having let herself go), “You men, so terrified of what we might do, you keep us stupid, you keep us complacent. You hold all the power,” there’s just as much sadness in her voice as rage. Up to this point in the season, Kai’s actions seemed to have been driven by a duel thirst for power and control. He acquired his followers based on what they could give him in his ultimate quest to win the town council seat, and from that seat, he wants to win an even higher position within the government. But with the reveal he’s actually in league with SCUM’s Bebe (if that is really who she is), as well as his total indifference to the murder of one of his loyal followers at the hands of traitors seems to suggest what he’s really after is chaos. His lack of a platform, his willingness to court Trump supporters and Clinton devotees, might appear at first to be an essential detail of his charismatic persona—you can attract everyone and alienate no one by parroting their beliefs right back to them. But perhaps what he really wants to see isn’t a new world order, but no world order. This is a horror story, after all, and a cult leader bent on anarchy is even scarier than one going after tyranny. Someone looking for power might stop, or at least pull back when that power is in their grasp. Someone looking for chaos will never stop as long as there’s one thing left to burn to the ground. How often do health inspectors stop by restaurants, and do they make their visits unannounced? Because Butchery on Main should at least be at a Grade C by now. Even staring death in the face, Billy Eichner is funny. Yes, the moment he screams, “I’m a man,” he’s attempting to erase his history of marginalization to join the patriarchy, completely acknowledging that doing so means dismissing and degrading an entire gender. But if you close your eyes, it just sounds like he’s trying out a new bit for Billy on the Street. Dunham’s performance overall was great. The accent could have been skipped. Where’s Ally? There are a few moments when the fact she’s being held and questioned by police is brought up, but she’s almost completely absent from the episode. Of course, there’s also a hilarious moment when Ivy attempts to take the moral high ground with Harrison, pointing out while he let his wife get killed, she only drove her wife insane. There are levels, people.